The underactive thyroid diet is a topic that is up for a lot of discussions! But prior to rushing for the thyroid diet plan, it is of utmost importance to know about hypothyroidism. 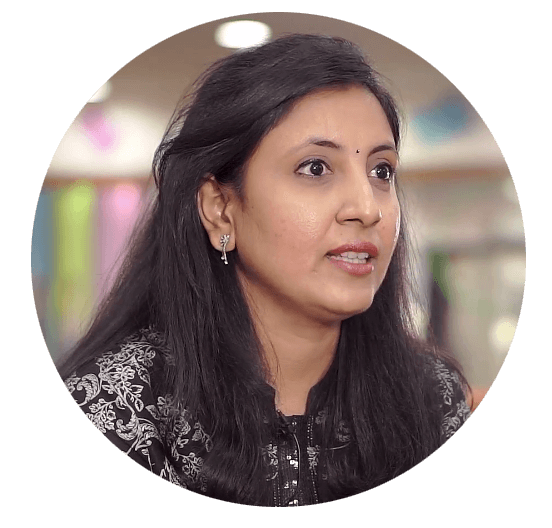 According to studies, the prevalence of hypothyroidism, the condition where the thyroid gland becomes underactive, in India is 11%, compared while only 2% in the UK and 4·6% in the USA. Although incurable, hypothyroidism or thyroid issue as a whole is found to be manageable with the right balanced-diet and lifestyle changes. The thyroid diet plan basically forbids the inclusion of certain cruciferous vegetables like cabbage, cauliflower, broccoli, turnip. Get FREE Diet Consultation Today! A ‘Goitrogen’ is a term used to describe substances that interfere with the thyroid gland function. Goitrogens can be from different origins like drugs, chemicals or even food. These substances block the uptake of iodine by the thyroid gland and disrupt the thyroid hormone production. 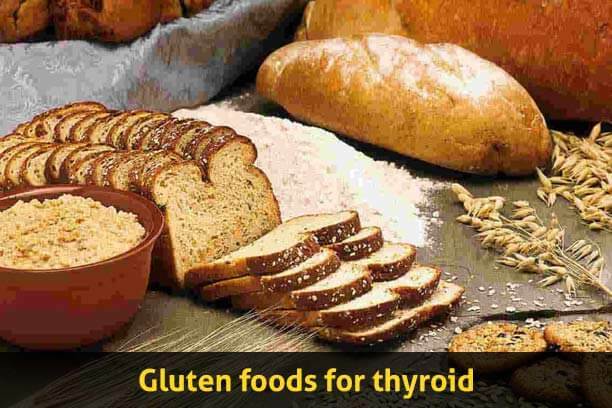 Since iodine is an essential nutrient in the synthesis of thyroid hormone, many believe that eating foods that contain goitrogens can inhibit thyroid function leading to underactive thyroid or hypothyroidism. These foods can further aggravate the symptoms of thyroid deficiency. One of the major symptoms of poor thyroid function is weight gain. This blog of ours explains the inter-relationship of thyroid and weight loss in great detail. Although we can’t say about a permanent cure for hypothyroidism, however, the right diet can help manage the disease better. 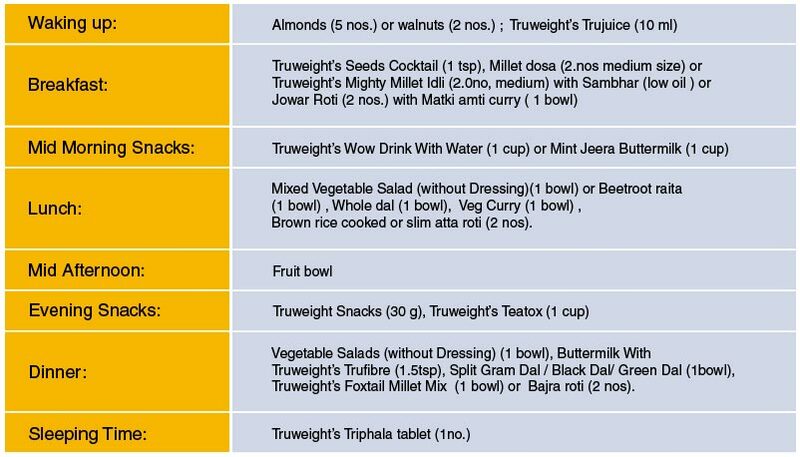 then this FREE Truweight Nutritionist Consultation on thyroid treatment is just for you! Here is the list of foods to avoid while following a thyroid diet chart. Remember that while following a thyroid diet chart, the foods to be avoided are as important as the foods that are recommended. So go through this list and keep them away for the sake of your thyroid gland. Gluten is a protein that is found in wheat, barley, oats, and their food products. The main drawback of consuming gluten by hypothyroid people is that it hampers the gut system and causes body inflammation. This affects the immune system and makes the immune system attack the body’s own thyroid. This readily enhances hypothyroidism. 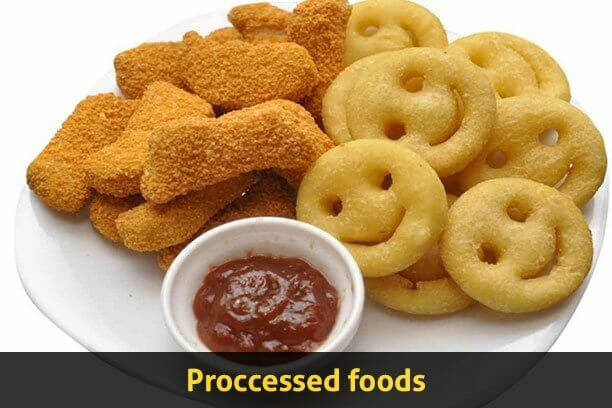 The Processed foods can be the villains in hypothyroidism. However, that doesn’t mean they are good otherwise. We might think that increasing the salt intake can better the iodine condition of hypothyroidism. But that isn’t true. Firstly, the salt content of processed foods is very high and that salt does not necessarily contain iodine. Also, the thyroid’s activity is restricted due to mechanisms like the production of cytokines that inhibits thyroid function or inclusion of iodine molecule in protein chain of thyroglobulin, that inhibits thyroid’s normal functioning . Moreover, the processed foods that contain added sugar inhibits the conversion of T4 to T3, which isn’t good for hypothyroidism. A Cruciferous vegetables like cabbage, cauliflower, broccoli, turnip, bok choy, mustard greens, and watercress contain a substance called ‘thiocyanate’ that in very high concentrations can interfere with iodine absorption. Hence, physicians advise against them as a part of a planned diet for hypothyroidism. So, a thyroid diet plan should clearly concentrate on the levels of intake. For a normal individual with normal thyroid hormone levels eating cruciferous vegetables has far more health benefits than the potential risk to worsen thyroid function. Eating these foods in normal amounts in the cooked form should be continued. One must avoid believing the myth to avoid all cruciferous vegetables to promote thyroid health. Too much consumption of raw cruciferous vegetables can have an adverse effect in individuals with iodine deficiency or those with hypothyroidism. 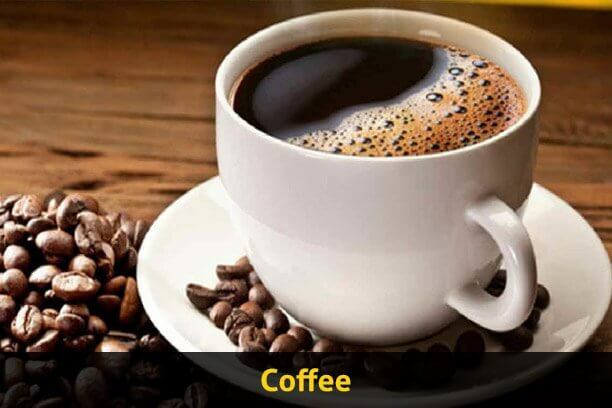 So avoiding coffee, especially before taking thyroid medications is nutritionist recommended. 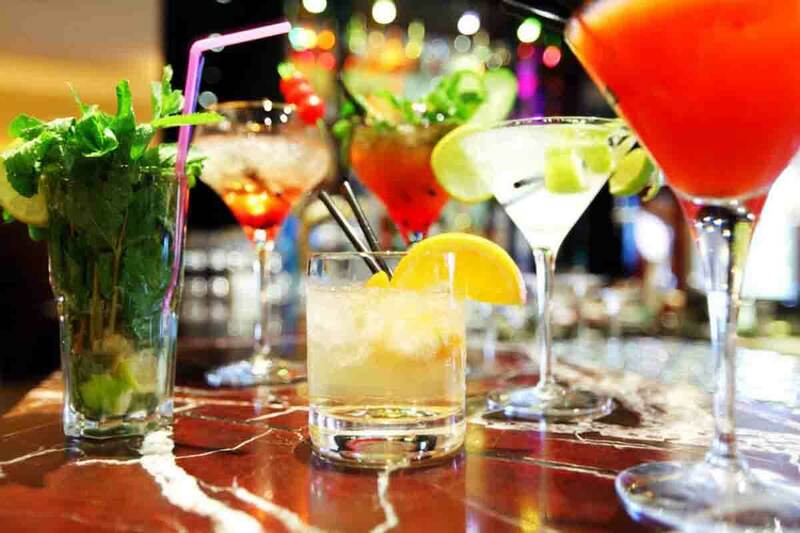 The Alcohol should be avoided in a diet for thyroid patient. It has been scientifically proven that Alcohol suppresses the functioning of thyroid gland. Moreover, Alcohol causes cellular toxicity . It has been reported by The University of Maryland and Medical Center that reducing or avoiding alcohol can significantly reduce hypothyroidism symptoms. For an individual suffering from hypothyroidism, consumption of usual amounts of these foods only minimally raises the risk of worsening the symptoms of the thyroid. Using iodized salt regularly and including iodine-rich seafood can help to provide the required iodine for thyroid function. The above article will give you an insight into what foods to include and avoid but the diet plan should include all food groups. This will help you in an efficient supply of nutrients with better management of the disorder. The common symptoms include- Fatigue, cold, excess weight gain, constipation, dry skin, muscle weakness, puffy face, elevated levels of blood cholesterol, tenderness in the muscles. 3. What foods to include in the hypothyroid diet plan? Food options like mixed nuts, brown bread, fruit bowl, brown rice, multigrain roti, mint jeera buttermilk, cucumber carrot juice, green tea, ginger tea, low-fat milk with turmeric imparts health benefits in hypothyroidism. With appropriate diet and proper exercise under expert’s guidance, complications of thyroid disorders can be reduced. 5. 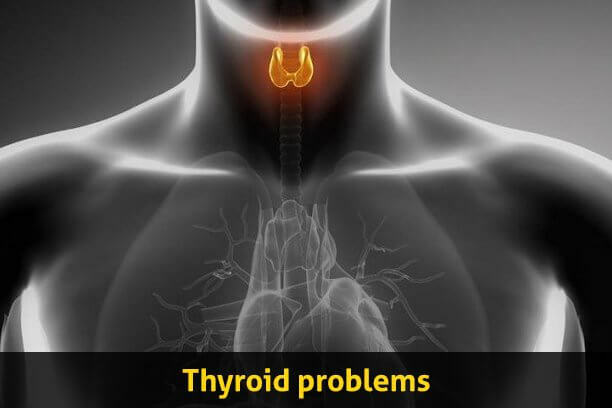 What can be the complications if hypothyroidism remains unchecked? If remain unchecked, hypothyroidism can lead to birth defects, mental health issues like anxiety and depression, heart problems and even, goiter. Also Read: Simple exercises for thyroid problems!